The humble broad or fava bean. Forever immortalised by The Silence of the Lambs, it always signifies the beginning of Summer to me. 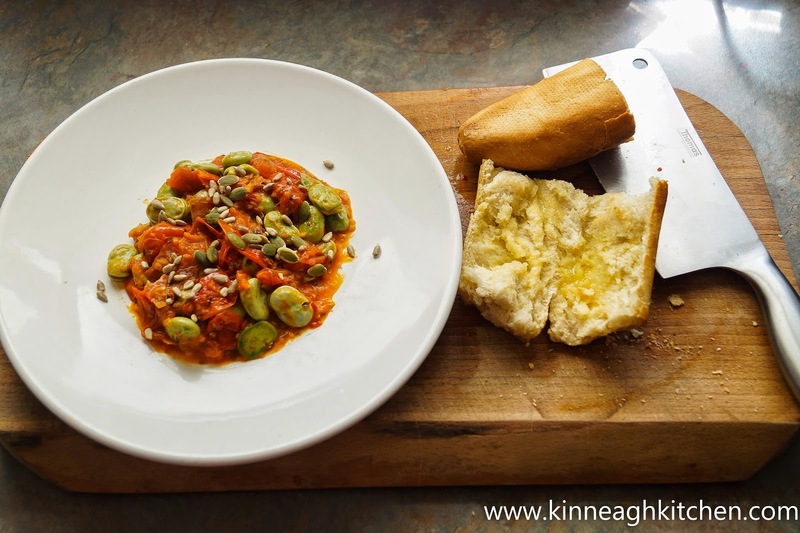 This is a recipe from a couple of years ago but is still my favourite way to serve these legumes. 300g of broad beans may seem like a lot for one person but once they’re podded, only about 100-130g remain. To pod the beans, snap off the top, tear along the seam and open to reveal the individual beans. You can pop them out of their skin but I only bother doing this with the bigger ones. 1. Heat the oil in a pan over a medium-low heat and add the prosciutto. Cook for 2 minutes before adding the garlic and chilli. Season well and cook for 5-6 mins until softened but not coloured. Add the tomatoes, oregano and a good glug of boiling water. Cook for 5-7 minutes, stirring occasionally. 2. Meanwhile add the broad beans to a pan of boiling water and cook for a minute and a half. Strain and set aside. If you do this too early, then run the beans under cold water to stop them cooking. Ideally have the beans ready to come out of the pan when the sauce is ready. 3. With a potato masher or fork, mash the tomatoes to make a rich sauce and add the cooked beans. Cook for another 2 minutes before checking for seasoning, adding more salt/pepper if required. Sprinkle some of the seeds on top and serve with crusty bread or toast.